It is very likely that you recall the moment after receiving a significant medical diagnosis for yourself or a loved one. Some have described it as the moment when fear—even terror—gripped their heart. They felt the earth shift under their feet, felt they couldn’t breathe, and became lightheaded. Anxiety mounted in ways they hadn’t previously known because of coming face to face with the unknown. Others have said that that they wanted to run away from the news—to push it as far away as possible. 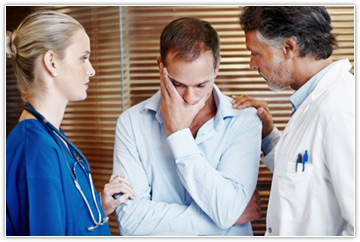 Time may be divided into pre-diagnosis and post-diagnosis, symbolizing the many lifestyle changes that have become necessary after this pivotal moment in time. . .the moment when illness came knocking uninvited at your door. You never thought it would be like this. Sometimes it is overwhelming. And all of it seems so unfair. I hear what you are saying. I am a registered nurse with many years of experience working with adults, adolescents, and children in the hospital setting. I have witnessed the stories of many families as they have struggled to cope in the face of difficult medical conditions. Whatever your specific situation, your concerns deserve to be heard in a safe place. Seek care for yourself. Please do not hesitate to contact me today.